Students use a variety of resources to make sense of integration, and interpreting the definite integral as a sum of infinitesimal products (rooted in the concept of a Riemann sum) is particularly useful in many physical contexts. This study of beginning and upper-level undergraduate physics students examines some obstacles students encounter when trying to make sense of integration, as well as some discomfort and skepticism some students maintain even after constructing useful conceptions of the integral. In particular, many students attempt to explain what integration does by trying to use algebraic sense-making to interpret the symbolic manipulations involved in using the Fundamental Theorem of Calculus. Consequently, students demonstrate a reluctance to use their understanding of “what a Riemann sum does” to interpret “what an integral does.” This research suggests an absence of instructional attention to subtle differences between sense-making in algebra and sense-making in calculus, perhaps inhibiting efforts to promote Riemann sum interpretations of the integral during calculus instruction. This research was supported in part by the National Science Foundation under grant No. PHY-1405616, and in part by a faculty development leave from Xavier University. Any opinions, findings, conclusions, or recommendations expressed in this paper are those of the author and do not necessarily reflect the views of the National Science Foundation or Xavier University. I would like to thank Corinne Manogue, Tevian Dray, John Thompson, and Mike Loverude for their thoughtful conversations and feedback throughout the course this research. Dray, T., Edwards, B., & Manogue, C. A. (2008). Bridging the gap between mathematics and physics. Retrieved from http://tsg.icme11.org/document/get/659. Engelke, N., & Sealey, V. (2009). The great gorilla jump: A Riemann sum investigation. Paper presented at the 12th Annual Conference on Research in Undergraduate Mathematics Education, Raleigh, NC. Retrived from http://sigmaa.maa.org/rume/crume2009/proceedings.html. Wagner, J. F. (2016). Analyzing students’ interpretations of the definite integral as concept projections. In (Eds.) 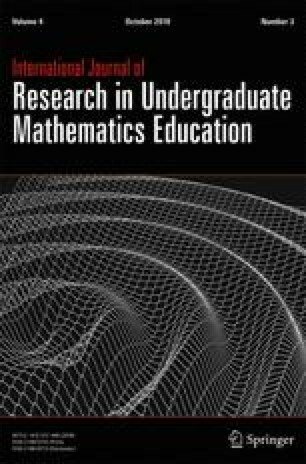 T. Fukawa-Connelly, N. Infante, M. Wawro, and S. Brown, Proceedings of the 19th Annual Conference on Research in Undergraduate Mathematics Education (pp. 1385-1392). Pittsburgh, PA. Retrived from http://sigmaa.maa.org/rume/RUME19v3.pdf.